Hey! – The program’s gone wrong and we are getting some nice weather. We arrived with blue skies after driving down the small lanes and finding the green in a beautiful estate. There was plenty of room to park and we only had to walk across to a building of the house to find a social club with a bar and a buffet lunch, which included cakes like Mum used to make. When we all went to the green we could take in the sight of the new club house that had been built with help from Sport England and the Lottery. Superb changing rooms and facilities and meeting room. 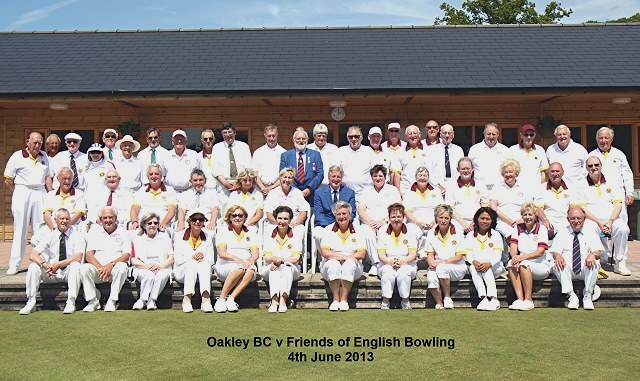 Thanks to Oakley Bowls Club for a brilliant day. Fund raising and supporting the game of flat green bowls in England. We use some harmless cookies to count visitors, and to give you the best experience on our website. Click 'OK' to accept this and continue, or read our 'Privacy and Cookies' page to control cookies on your device.